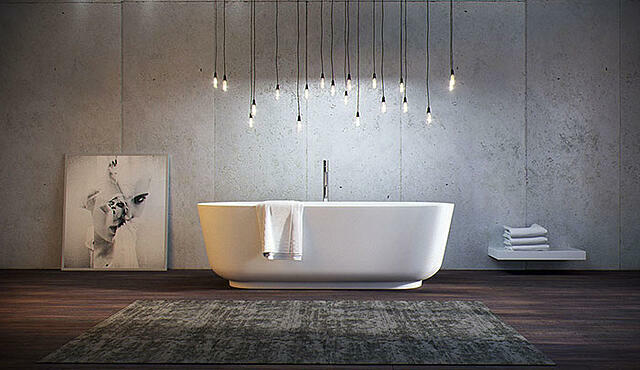 If you’re looking to renovate any of your home’s bathrooms in the future, these incredible bathroom designs will inspire you. Sleek, modern hardware and fixtures tie into a number of themes from the minimalist to the contemporary. 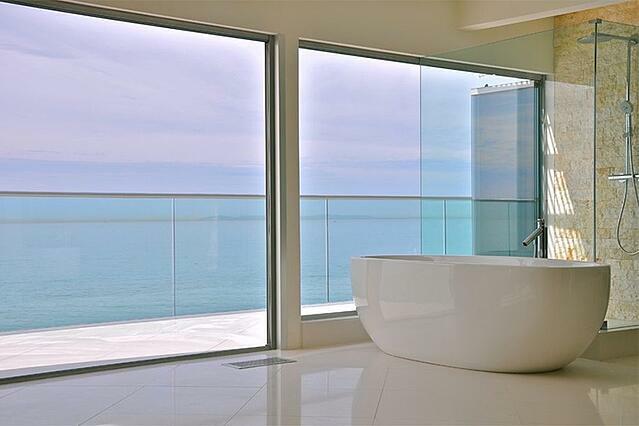 Pair your own ideas with some of these beautiful concepts to build your dream bathroom. Deep shadows and dark colors create depth. The liveliness of the vegetation and the natural sunlight lighting up the room make this bathroom warm and welcoming to anyone. Using natural elements to decorate your bathroom offers a unique, but incredible bathroom aesthetic. Natural stone and wooden bathroom furniture in combination with candlelight and a natural color scheme makes any bathroom appear spacious and clean. 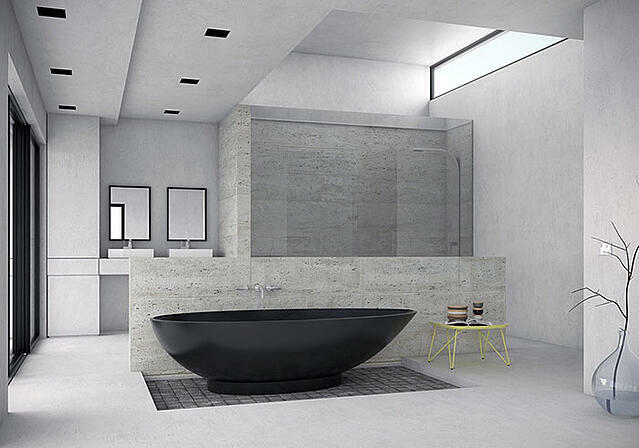 Seemingly bare, this bathroom concept goes to the extreme of minimalism. A unique hanging light fixture makes visible a simple arrangement of bizarre artwork and one shelf unit. A deep, soft carpet sits atop the hardwood floor that ties the whole scene together. Parallel lines and geometric shapes keep the eye from settling on one spot; until you see the bathtub. The satin black tub along with its sleek faucet becomes the focus of the image, complimented by its sitting inside of a recessed tile drain platform. With much more color and a little bit more of an eccentric taste, this bathroom doubles as a lounge or reading room. With space to spare in this bathroom design, the scene is tied together by a single piece of furniture that rests in the middle of the room. Not to mention, the unique piping that outlines the exterior of the tub really ties in well with the blue green hues and other sleek fixtures. Appearing as a master bathroom that doubles as a sunroom, this incredible bathroom design looks like something out of a luxury hotel. The enormous floor to ceiling windows paired with sleek and simple light fixtures make it feel very spacious. 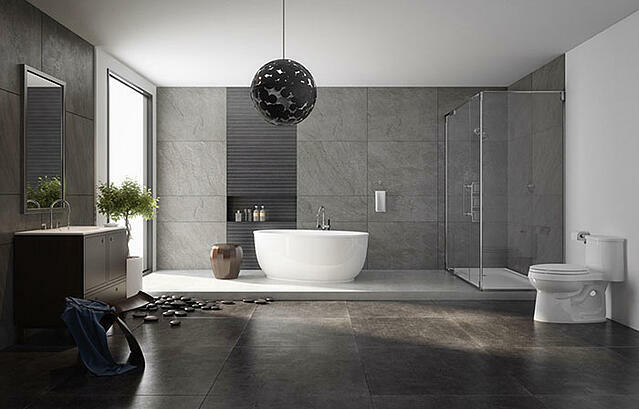 The bathroom has morphed from simply utilitarian to a living space in its own right. A space where you relax and escape the daily grind, where you meditate or contemplate expansive views in a zen like ambiance; an uncluttered space, like this California residence outfitted with frameless sliding glass doors by Cover Glass USA. 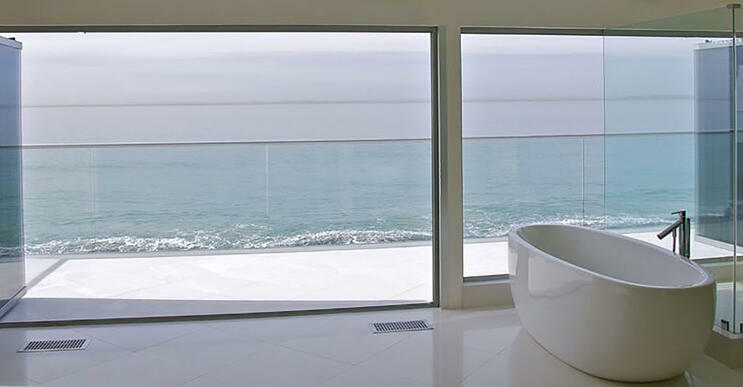 Interested with installing frameless sliding glass doors in your home?